It is a general belief that IT geek should live in darkness with the only light source being computer monitor. Personally, I always liked bright light, but It was never bright enough. 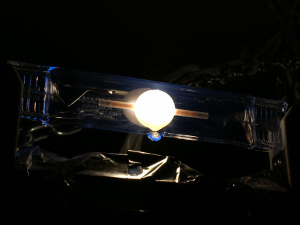 Initially my room was lit by 300W of incandescent lamps (4500 lm), then 250W of CFL (~15000 lm), then 500W halogen (~12500 lm)... But it all was way too weak. I always wanted light to be so bright, that you don't want to make it brighter. Now I achieved this goal and happy to share the results. This actually happened to me: recently I needed an PCI-E x1 videocard, as all x16 slots were already occupied. PCI-E x1 cards are being sold but they are rare and quite expensive. 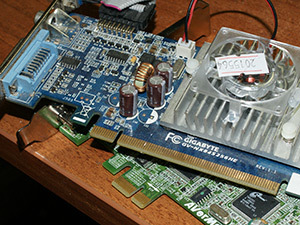 I decided to try to upgrade (or better say modify) my spare PCI-E x16 videocard nVidia 8400GS to fit into x1 slot. There are 2 possible approaches to this problem: remove a "wall" on PCI-E x1 slot on the motherboard so that x16 card fits in, or cut the videocard. As motherboard was still on warranty, I decided to cut the videocard. 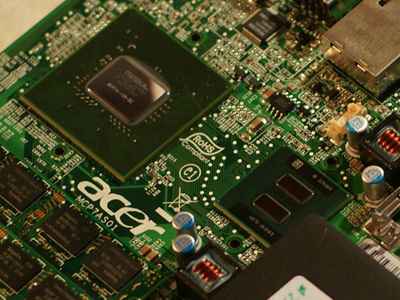 Since 1975 when one need a processor – the only option is to buy one. In the most complex case one might consider going for configurable FPGA processor (like Nios II) with few extra commands, and that's it. Nowadays it is hard to believe that these fancy processors might be obtained some other way than just buying one. It's just like thinking that beef and bread is only made in the local shop. Why one would need to return to "root" technology? Well, to be sure that we can resurrect the technology if something happens with current Chinese factories and Engeneering centers in few countries and to know in very detail how exactly things works. It appeared that there are guys who did developed homemade processors as a hobby. They are usually made out of low-scale microchips (registers, counters, e.t.c) or low level discrete elements (transistors, relays). The only big chips used are memory and flash memory. In this article I want to do a brief on architecture of homemade processors and show some greatest processors made at home. Some might say "Hey, this 7 meter meteorite is so tiny to cause any damage". I am not going just believe that, let's find out by ourselves! The only thing you should remember from School physics course is that every moving body have kinetic energy, and whatever you do with that body – amount of energy is preserved. I.e. when meteorite hit the Earth – this energy gets converted to heat of explosion and shock-wave.